It's September 1st and I'm slightly bummed with myself. I didn't get done with the book as I had hoped. Not for a lack of trying through! I've found a lot that needed work and feel the story is stronger for all the work these last two months. I shouldn't be upset with myself, there have been a few big events this month that slowed me, one being surgery and the other is school starting for kiddo along with football - those both pulled days from my writing schedule. I've also found that with all else I do in a day, I need to have a schedule. So I usually only work on writing for an hour a day, some days more if I have the time with kiddo out and such. But mostly with working full time, cooking dinner, and all other things in life, an hour is what I can squeeze out most evenings. I also take breaks. I can't stress over it as I find I start to clam up on the words. In rewrites its not always how big of a section you get through or how many words you add or delete. No. Sometimes, it's what you realize needs done and how to add it in that's the major accomplishment. I found that out the first night in August. I didn't get through a large section but it dawned on me that I had a character that needs to be seen before I had him, at the end. And I scribbled notes on where to add him along with searched for a name for him. I had an idea of what his part is in the story but didn't really create him before. So, I'm working through the ending of the story now. I feel much better with the direction of the story, though I know it needs a hell of a lot of work yet. I'm still going to be embarrassed to send it to anyone to read, but that's a step I'm going to have to overcome one day here. For now, I'm working on this ending and hoping to finish the book in a weeks time (that's what I keep saying and that week comes and goes). First, I want to mention one thing... I have NO idea how authors accomplish so much and live a life! They are amazing! I've not made many words with life being as busy as it is with kiddo's therapy and exercises at home I help with, working full time, editing work part time, and sleep. I'm a sleeper and have to get 7-8 hrs of sleep at night. There just isn't enough time in the day! Okay, what have I accomplished? 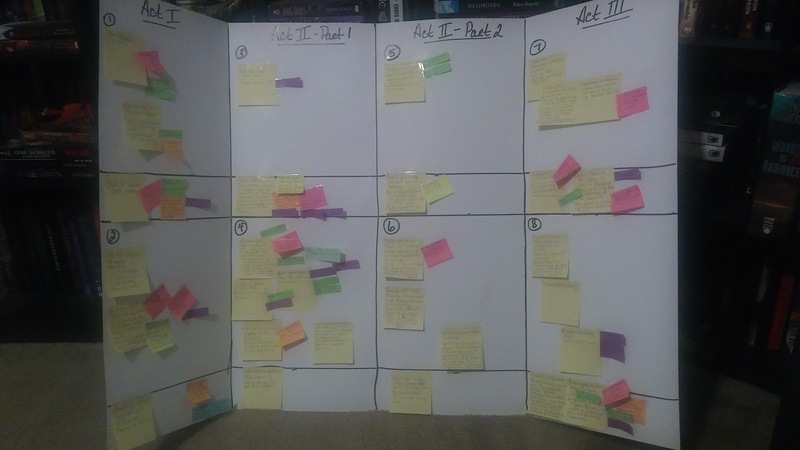 I've added all the notes on my plot board to Scrivener! While I typed it up in Scrivener, I ran through the scenes in my mind. In this process I found a few scenes needed to be rearranged. I also found that I felt like I had written a few of these scenes already. I have notes on them but not completely done, it felt as it was complete in my mind. So this will make for writing the first draft easier. Right? I did come across a few scenes that needed to be added as I had a character pop into my mind that needed to be in the story to help things along. I'm going to say, from the scenes I have listed, that the book will be a short novel at 60k words. This breaks my heart but I think I have to admit it. Something has to give these days. There is way to much going on at one time and I can't get anything done. So, I'm going to put writing on the back burner for a few months. I hate to say that and that I'll actually do it. But I'm stressing myself out over everything these days, and writing has been put last as it is. Kiddo comes first. I have to be there for him to work through therapy and exercises at home. I'm his cheering squad and his whip. I will be there to get him through. I also need the spare money that content editing brings in, and that time is limited with all the work into getting kiddo's knee straight and moving again. I'm hoping in a few months things will be moving better and life a bit calmer so I can relax and enjoy writing. I see that Camp NaNoWriMo will be starting April 1st. 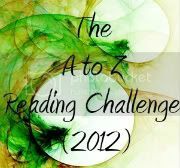 I wish I could say I would be doing it as I have a book all ready to be written. But I don't think I'll be ready by then. A few months... I hope. Once again, I'm late at posting about the month past. But with holidays it's hard! lol. So I had planned to write my second Christmas story in the month of December with all the craziness that comes with Christmas. I didn't get to do that. The events of life, kiddo and knee therapy along with the go-go-go of the holidays disrupted the idea this year. Why? Because it gave me the month to listen to the seasonal music, and listen I did. I had the radio on constant Holiday cheer from Thanksgiving. And to get into the season so I could come up with ideas for the story. I now have a list of things that can happen. I also made verbal notes into my phone that would be the scene or part of a scene. 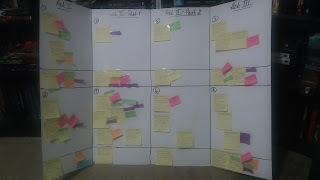 I have typed those up and have those ready for when I get to planning and writing. This is a step forward for me. These holiday stories come in a completely different fashion than other stories have. They are almost outlined in my head. Keep in mind, I don't outline very well. AT ALL. So this is something new for me. My plans are to make a plot board for the book so I can keep track of all that is to happen and influences in the story by the 'holiday spirit'. I'll share that with you next month. Here's to producing more words!